We are super excited to present Nikolai! He was born in 1956 and resides in St.Petersburg, Russia. Since the first solo show of paintings and graphics in 1981 participated in more than 90 exhibitions in Europe and the USA including several joint American-Russian projects. 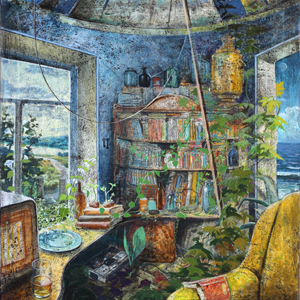 His favorite techniques – oils, acrylics, computer graphics, prefer textured canvas and hand-made paper among materials. 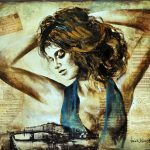 Set on the modern stage of the Los Angeles Convention Center, this international, fine art show will serve as a visual montage of influential fine art in 2014, as it exists across the globe. Art is not bound by one medium or movement and is pursued regardless of power or profit. In this spirit, World Wide Art Los Angeles will be inclusive of both classic and contemporary art forms, united for the unique purpose of reflecting this moment in art. Nelli Aharonova was born in Armenia in 1948 and has been fascinated by art since her childhood. Her first personal exhibition was held in 1975 in Yerevan. At that time her work was mainly in the form of applications. She used pieces of leather, fur, cardboard, paper, cloth, glass beads. 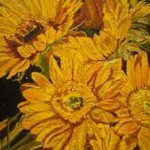 For the first time she presented the paintings of flowers in 3D, whose creation was inspired by Armenian landscapes and her trips to California and Texas. It is in the paintings of flowers that the artist’s love of life, nature and beauty is expressed.